Create photo slideshow with background music. Burn photos and videos to one DVD/Blu-ray disc. Built-in editor to adjust transition settings, apply music effects, etc. When it comes to making presentations with slideshows, it is important to add music. A picture slideshow with music is more attractive to people who have to view the slideshow. This is true regardless of the purpose of the slideshow. Maybe you are looking to compile all your photos into an attractive presentation. In that case, a photo slideshow with music will set the right tone and put your viewers in the right mood. Perhaps you are making a business presentation to clients or your superiors. You might be tempted to keep things ‘professional’ but if you add music to photo slideshow, it makes you stand out from the crowd. Music a fantastic asset to add to any slideshow presentation and you will be bereft not to have it. If you are wondering how to make a DVD with pictures and music then we highly recommend Wondershare DVD Creator. The software is perfect for creating high-quality DVD slideshows using pictures and music. 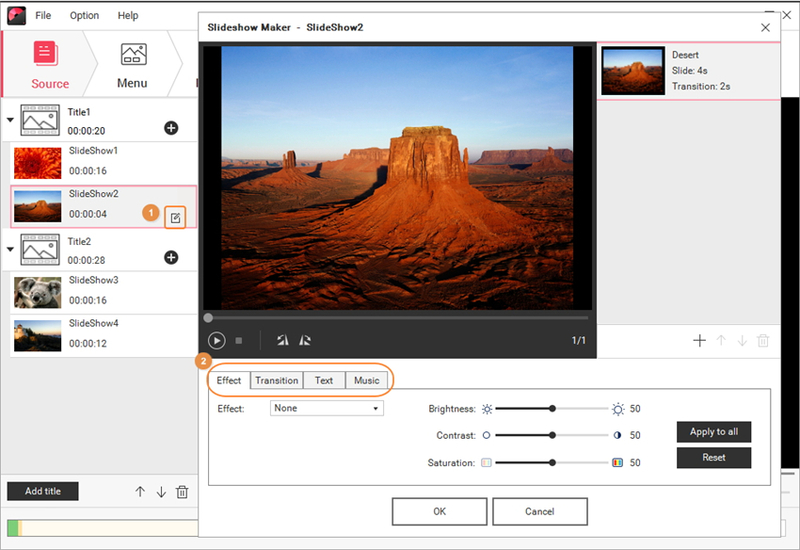 Wondershare makes the entire process easy, you will be creating DVD slideshows with music and high-resolution images in moments. If you don’t know how to put pictures and music on a DVD, then Wondershare DVD creator can guide you step by step. Add background music to photo slideshow and burn into DVD/Blu-ray disc to playback on TV. Support any image files, include .bmp, .jpg, .jpeg, .png, .gif, .tif, and others. 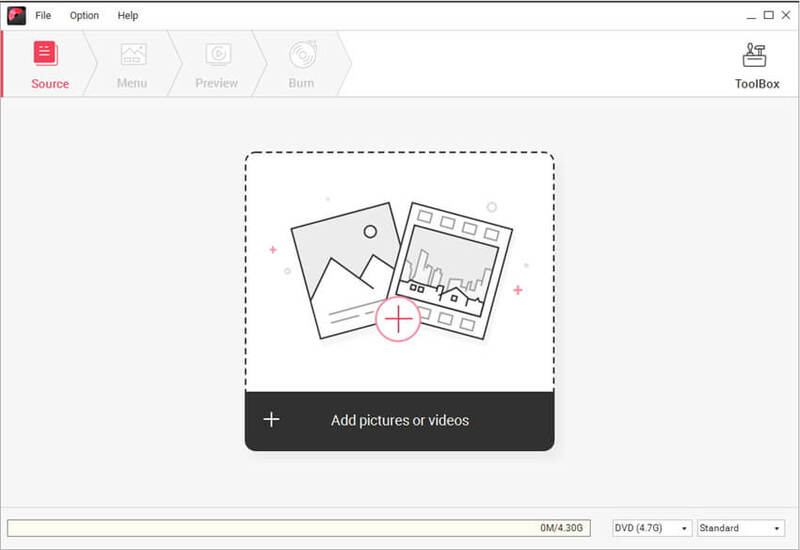 Create photo slideshow video with music, effects, and other customization features. Edit images with effects, transitions, text, music, and others to make the photo slideshow special. Provide 100+ free static and dynamic DVD menu templates from Family Life, Travel to Holiday theme. Customize photo to slideshow DVD menu by changing background image, adding title/thumbnail, creating chapters and more. Additional functions such as creating data disc, burning ISO to DVD, editing videos, copying DVD, convert DVD to video, etc. 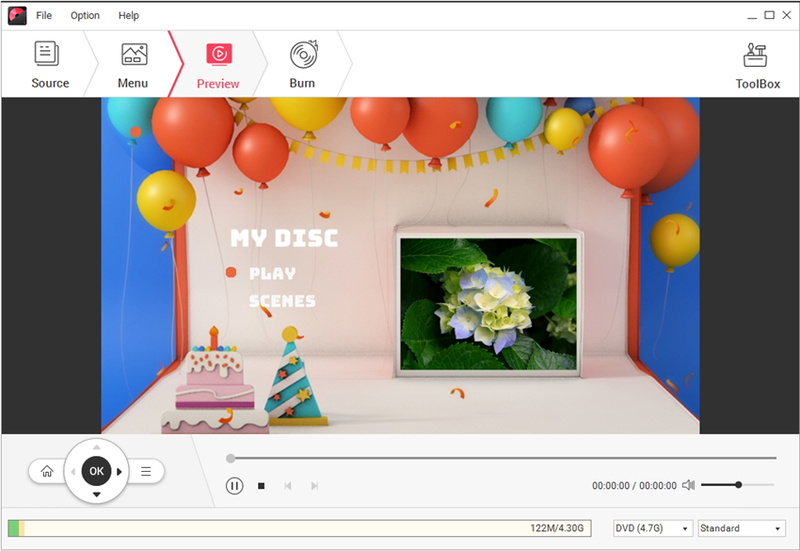 When you open Wondershare DVD creator you can choose between Create a Blu-ray(BDMV) Disc slideshow or Create a DVD Video Disc slideshow. Select the DVD option as an example. You will get a blank screen when you first start out. To add images click on the + icon under the Source tab. As you add images, the left column will display their thumbnails. Each picture you add has a pencil icon in the corner. Click on the pencil icon to start editing the picture. You can apply effects, set transition, add text and background music to the pictures. This is the crucial step you need to complete to turn photos into DVD slideshow with music. Click on the music tab and click on the music icon to add background music. Choose songs which most suitable for your slideshow and click OK to confirm. You can customize the DVD menu using a wide range of templates. If you are not happy with these choices, then you can download some more by clicking on the download icon. 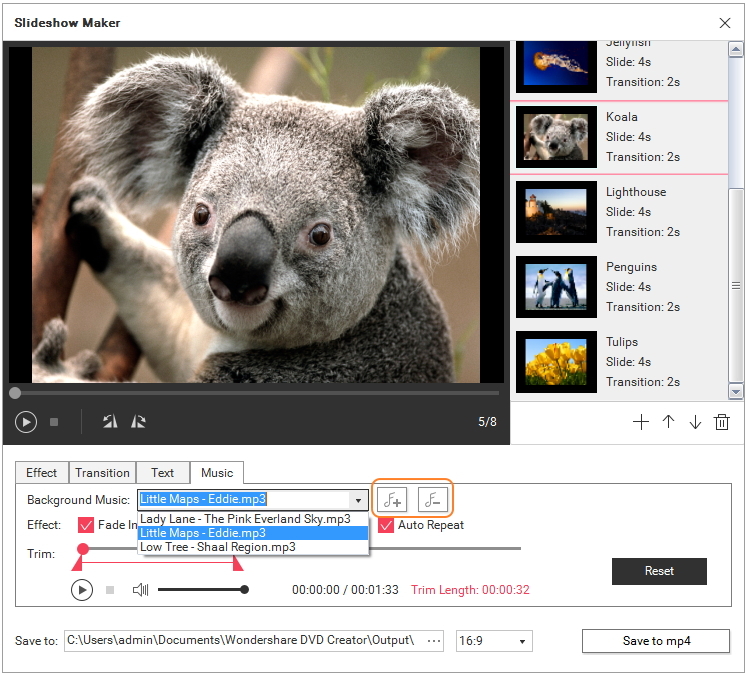 Now is the time to add the finishing touches to your DVD slideshows with music. Click the music icons upon the menu preview window and a Customize Background Music window will open. 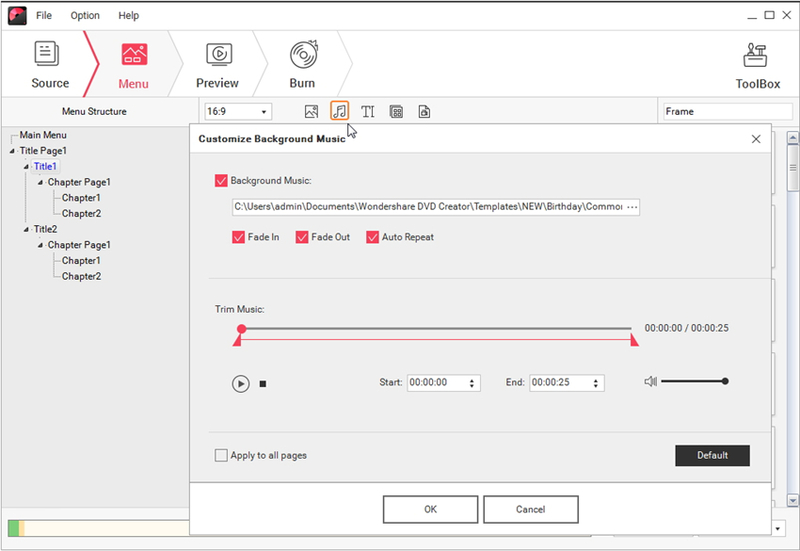 You can not only customize the background music of the menu but change background pictures, add text/thumbnail, create chapters, using the editing options below. Click on the Preview tab to see how the finished product looks. If you are not happy with the result, simply click on the previous tabs to make changes. The final step is to turn photos into DVD slideshow with music. Click on Burn tab and a Burn Settings window will appear. 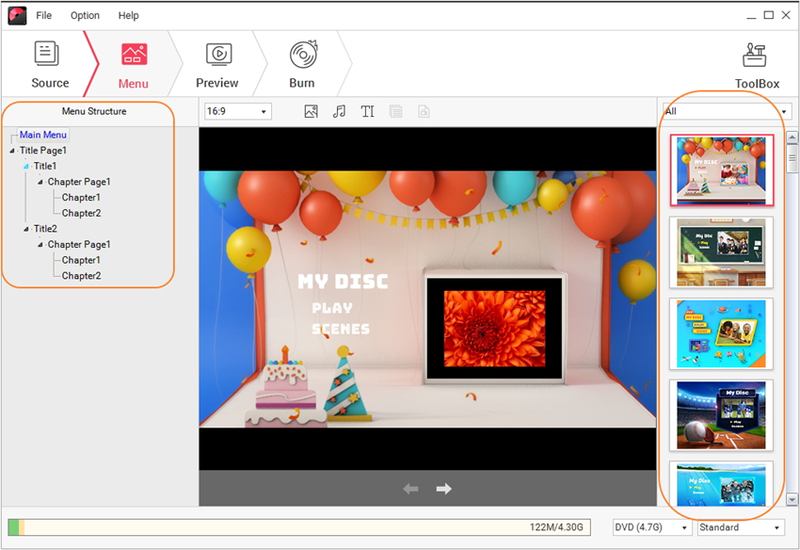 Choose Burn to disc or Save as ISO files as you wish, finish the Disc label and other parameters and click Burn button, Wondershare DVD Creator will create your slideshow DVD. Default program in Windows OS, therefore, no need to pay for the system. Simpler to use great for those who don’t know how to make a slideshow of photos with background music. Uses local resources (pictures and songs) to make an attractive slideshow. Great for people who have no interest in learning specialist software. 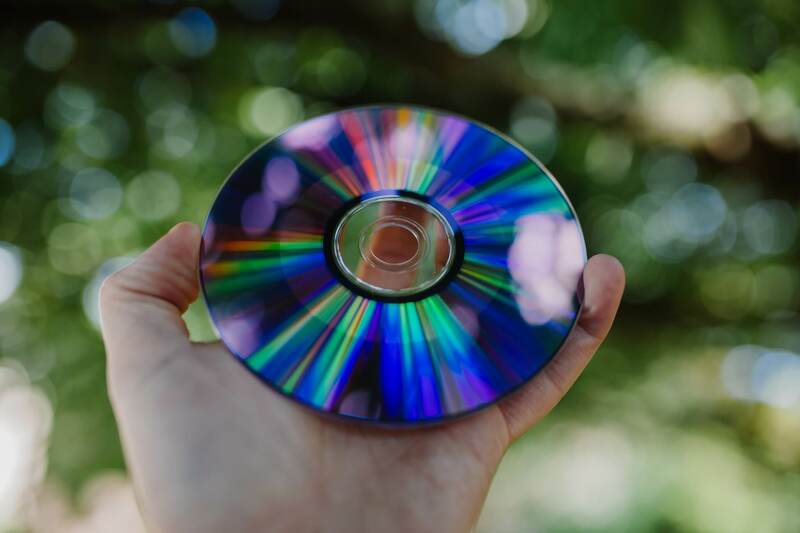 If you are wondering how to put pictures and music on a DVD with Windows Media Player we provide guidance, jsut follow the steps outlined below to create a slideshow with music in the background. Step 1 Navigate to the Pictures+Videos option on the main menu. Select Pictures + Videos to go to the next step. Step 2 In the Pictures Library, go to the slideshow option and select Create Slideshow option. Step 3 Before creating a photo slideshow with music, you must first name the slideshow. Step 4 You must now choose the pictures that will make up your DVD slideshows with music. To select pictures from a local computer disk, choose Picture Library. Click on Next. Step 5 Before selecting the background music, you have the option to review and edit the slideshow. Step 6 Now you must choose the background music for the picture slideshow with music. Click on Music Library to choose a song from your local drive and click Next. Step 7 Browse through your local music library to select songs for the slideshow. Select your songs and click Next. Step 8 You can review the playlist if you are happy with the final results to click on Create. Step 9 Once the slideshow is complete, it will be stored in the Slideshow. Select the slideshow and click on Play Slide Show to see your final work. Step 10 If you ever feel the need to make changes, it can be done by going to Tasks > Pictures > Slide Shows. Choose from an array of editing options, like changing the order of pictures, timing, and background color. You even have the option to display information about the background music. 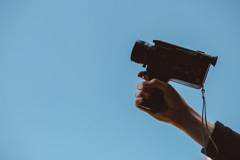 Once you are done with the above processes it would be easier for you to make the DVD slideshow of photos with background music through both methods. Well, if looking for the best process then going with Wondershare DVD Creator is the most suitable option. A software suite is a fantastic tool for creating and editing slideshows with background music. 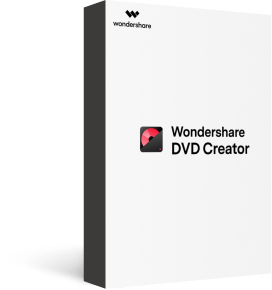 If you are curious about Wondershare DVD creator, visit the official website to download your own copy.